They were manufactured in England by various companies and ordered from catalogues. Various different styles, sizes and layouts were available to order. Once ordered the building would be shipped in kit form to the site. There it was erected by a mixture of company and local labour. The company that supplied the church in Sallins, was ‘Harrison and Company’ of Camberwell, London. Interestingly, it is recorded that one of the men sent to erect the church, a Mr. Edward Laxton, met and married a local lady and settled in the town. 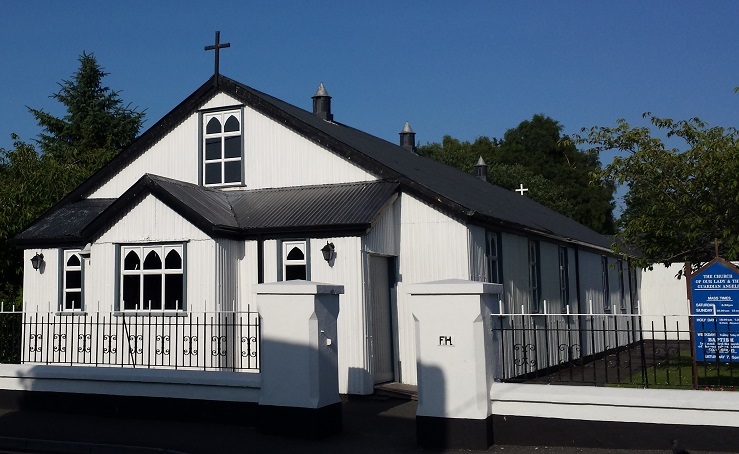 90 years later Father Norris’s little ‘tin church’ is still serving the people of Sallins, whose population has increased by a factor of ten since. 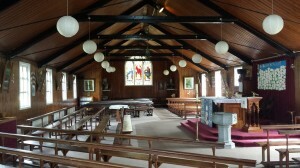 Previously ‘tin churches’ were much more common in Ireland. In Dublin for instance new suburbs usually had a temporary ‘tin church’ initially. But as the suburb grew, it was replaced with a much larger building, usually constructed in stone. This occurred in Whitehall, Merrion Road, Donneycarney, Harold’s Cross, Sutton, Foxrock, Portmarnock, Finglas and Harold’s Cross and perhaps many other areas. An intimate church. In the above parish histories, the tin churches were always remembered with much fondness. This is understandable. While the ‘tin churches’ are small and modest, they are also intimate. By contrast, the larger stone churches were built to house thousands, and while grander, they are less personal even cold, buildings. With the reduction in attendances, their large size is a further disadvantage, as they can often feel empty. Build costs. The tin churches were designed and built as modest temporary structures. 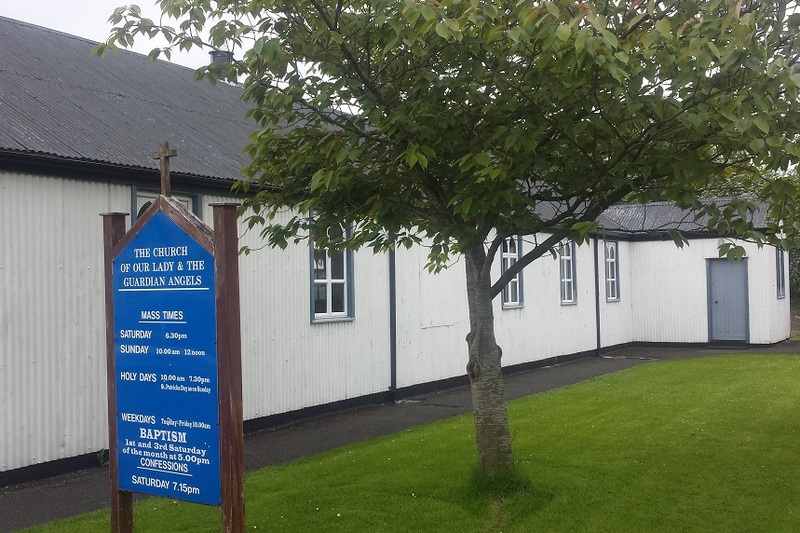 For instance, Sallins church was constructed for the sum of £870 in 1924, this is the equivalent of €57,100 today (or €634 per year of its existence). In fact Sallins ‘tin church’ was 40 times cheaper than the larger stone churches built during the same period. Adjusting for its much reduced capacity (approx. 4 times less), it’s ‘per seat’ price was still approximately ten times cheaper. Refurbishment costs. It is interesting to examine one of the famous large churches of this period in more detail. Turners Cross church in Cork City was constructed in 1931 for £30,000 (or €2.3 million in today’s money). 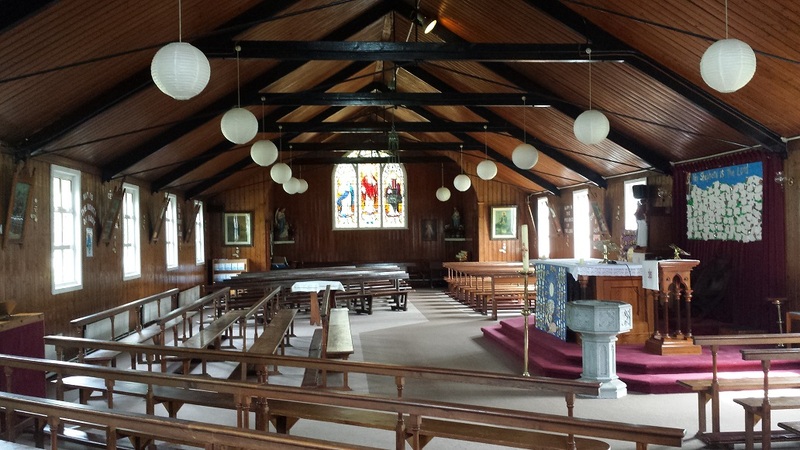 It is celebrated in architectural circles for being the first church in Ireland constructed in the ‘Art Deco’ style. Although it was designed for a long life span, it has undergone a major refurbishment programme costing millions of euro. 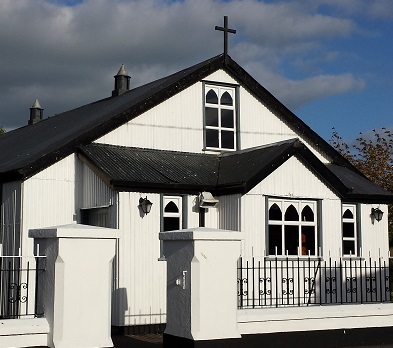 By contrast, Sallins Church designed and built ninety years ago, as a temporary church, has had little money spent on it since. Conservation. Tin churches in general have been unappreciated, but this seems to be changing. 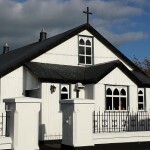 It is of note that the church in Sallins is now a protected structure. Hundreds were erected around the world at one stage, but most have since been demolished and replaced. As a result the numbers remaining in Ireland may be in single digits. There are at least five to my knowledge, see list below. As they are constructed from metal cladding and timber, the buildings have a limited life span unless they are maintained. The corrugated galvanised iron has a thin layer of corrosion resisting coating. But this is punctured by the nails used to secure the sheeting to the framework behind. These holes require particular attention to ensure that they remain sealed against water ingress. Otherwise the water will start to corrode the metal cladding and/ or the timber structural frame behind. By contrast the thousands of stone churches dotted around Ireland, are much better protected. Their exposed outer walls and roofs have been constructed using naturally long lasting stone and slate. The last shall be first. Therefore we are left with an interesting question. Are tin churches, which were originally designed to be modest, temporary and cheap, actually of more importance architecturally, due to their scarcity, than the large expensive stone churches? I think they might be. Ah! Mr Laxton was my grandfather! So nice to see!